Allison Carmichael wakes from a car wreck with no memory of the past three years. She doesn’t recall her husband’s death or how she alienated her friends, and she definitely doesn’t remember anything about her new boyfriend Vincent Drake – a charismatic man with a penchant for rare and unique possessions. In fact, the only things familiar to Allison are her seemingly common ailments – insomnia, lack of appetite, erratic body temperature – which have gone undiagnosed and are worsening. But Vincent knows exactly who, and what, Allison is – a mortal descendant of the first vampire. He is a vampire who has watched over Allison and her ancestors since the Biblical times of Cain and Abel ensuring their secret is kept. Once he realizes Allison’s symptoms are accelerating and transforming her, he’ll stop at nothing to have her. Vincent tells Allison that she is a descendant and the first of her kind to exhibit signs of vampirism. Her worsening symptoms mean that she must decide between risking her mortal death if she cannot control her symptoms or fully transforming into a vampire and damning her soul for eternity. 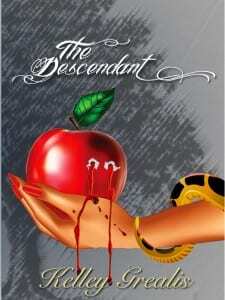 A decision made even more difficult when Allison discovers that Vincent has manipulated her life, and everyone in it, so that he can have the one thing no one else in the world has – the first descendant-turned-vampire. Thank you for hosting my author interview! I appreciate your support.